● Don’t sit, and certainly don’t stand, in front of the classroom. ● Please don’t allow the students to sit in rows. ● Don’t play ping-pong with the students. Find ways to let them talk to each other, not just argue back and forth with me. ● Try to become just another participant in the discussion. ● Give up the illusion of control. Let them take over. ● Find ways for a range of learning (strategies, outcomes, styles)—- but especially for experiential, collaborative and project based learning —- to flourish. Makes real sense, or at least it did to me for a great many years. But something didn’t quite take hold. I could say most of this and watch my students nod approvingly, but they never quite believed me, and I could see them wanting my oracular wisdom to take the floor. And, to be perfectly honest, I enjoyed those moments, too. Like having the last word, disclosing the “real” punchline, one that would allow them to appreciate the brilliance of my insights. Of course that only created the illusion (and believe me, it often felt quite satisfying) of a fully participatory, common educational process. But in fact it allowed me to retain control, to remain the teacher. Then, two years ago I began to inch my way forward. I did so because of the intellectual curiosity of a handful of students who asked me to allow them to read John Dewey, really read Dewey, and discover what exactly his philosophical pragmatism meant in terms of classroom practice. ● We must not separate schooling from its social context. ● We must try to be self-conscious of our individual roles in the classroom. ● We need to “announce” to one another our intent and expectations about learning. ● Each classroom, each individual, has the authority to create the protocols that will determine the learning culture in that classroom. ● Learning by doing teaches us to teach ourselves and to teach one another. We titled the course in question the ”Sankofa Project: the Theory and Practice of Urban Education.” Sankofa is an Ashanti, West African Adinkra, symbol of the importance of “return to know where you have come from.” This was our third year offering the course, which we built around weekly seminar meetings and discussions of important texts (Dewey, Ravitch, Kozol, Wagner etc), real and virtual visits with classroom teachers at many levels in many locales (thank you, Google Hangout) and two sets of visits to a public high school in Cleveland. Over the previous two years we had worked with Cleveland School of the Arts an audition required “magnet” school in the visual and performing arts. We visited the school for two days in October to get a feel for the teachers and students there, and again for a week in January for five days as participant-observers. The Kenyon students would then create a group project to present to the college community that derived from that practice. At our first session in late August we literally went around the table, peering over little paper table tents with our names clearly marked, and shared our goals and expectations. After all, the course title itself, “The Sankofa Project”claimed to explore just that. And while I can’t recall the exact content of that initial discussion I remember being very unhappy with the number of students (19) I had admitted to the class as well as its virtually all-white composition. Still, the students managed to talk about issues of procedure: wanting to avoid someone talking too much or too little, hoping for mutual respect and engagement, and holding one another responsible for completing assignments and maintaining civility in the classroom. Others spoke about wanting to become teachers and remembered moments in their studies that proved inspirational to them—particularly experiential moments that allowed them to see a world beyond their own frames of reference. The moment was working: they agreed to participate and even to cooperate. Our next three sessions followed this pattern. Polite conversation centered on several books on education, including the Jonathan Kozol’s Savage Inequalities, and Diane Ravitch’s most recent recanting on standardized tests and “No Child Left Behind,” and a “This American Life” podcast about a terrible and dangerous high school in Chicago. When the students looked my way I avoided their eyes, and when they invited me to say the last word I looked away. But we all clearly felt uncomfortable with this direction and with this format. Hard to tell at the time what was missing: but too much or too little of which key ingredient? Partly, this had to do with the demography of the class—nineteen students, majority female and virtually all white. Still, two of the students, both male both older, used their affect as men to great effect. They spoke with the kind of self-assurance that allowed for little ambiguity and even argument. And, in retrospect, this provided a fulcrum on which the course could alter its balance. Following a particularly intense discussion about the role of authority in the classroom, with some students arguing for the necessity for discipline and others against it, I sensed as much as felt this self-assurance in several male voices all arguing strongly for the need of “discipline” in the classroom. They seemed so self-confident, so grounded in a particular perspective that imagined the existence of some external source of right, known only to them, that I raised my eyebrows silently. The next day one of the women in the class found me sitting at the local coffee shop, and sheepishly confessed that something in the class was really troubling her. I don’t want complain, she said softly, but some of the “boys” make me feel that they have no respect for our, and she said “our,” opinions. She put into very specific words much of what I had ruminated about during the class. But what I had attributed to the way students who majored in political science or economics expressed themselves, she understood in terms of gender. At Kenyon, this is a subtle distinction, rather like reversing modifiers. But, it allowed me to take a critical course of action. Two more steps followed logically. With twenty of us in the class we decided to frame a broad discussion question, literally writing it on the whiteboard to start each seminar session. This became a creative consensus building exercise, edits here and clarifications there, which we took into the next several hours. But we also decided that our intellectual progress would be much better served by dividing the class into two smaller discussion sections; more space for each of us, more opportunity for serious exchange. As it turned out, the “teacher” could only be in one of these at a time. And he, or I, then chose to stay with the same small group for the entire session. This allowed both smaller groups to function democratically, openly, without the presence of my authority. In this way I became just another participant, virtually invisible in one of the groups and actually invisible in the other. The teacher is not in the school to impose certain ideas or to form certain habits in the child, but is there as a member of the community to select the influences which shall affect the child and to assist him in properly responding to these influences. This retake worked very well, and allowed me to think that such a moment of “taking stock” ought to become a best practice in creating and sustaining a democratic classroom. In contrast to the first session, this occasion, about a month into the course, derived from our shared experience–its successes and stumbles–and allowed the students a critical voice in their, and now our, intellectual community. This allowed us to function as a real group whose common goal was greater knowledge of and understanding about urban public education. We took two days during our October break to visit the Cleveland School of the Arts, and to understand its place within the complex school/society context, the urban corridor that Kurt Karakul has created. There the teachers and students greeted us warmly but warily: a platoon of white college students “observing us,” alongside “hey, when are you guys coming back.” I mostly stayed out of their way, a fact they hardly registered, and wandered the halls quietly. On the first floor, two of our students were already engaged with teaching a lesson on Vietnam and just outside that classroom door the English/Drama secondary teacher held his class and our Kenyon students spellbound as he taught dramatic reading of poetry while he pantomimed the poem–like a yoga instructor dressed in a top hat. Two more Kenyon students found themselves deeply involved in a photography project that constructed “Wanted” posters from digital images they had taken of each other and then of us. Mine looks somehow goofy and sinister. That night, seated at a long table in a tavern in University Heights we shared the stories of the day. It was like an athletic team’s end-of-season celebration, filled with good cheer and camaraderie. Our first experience outside the college classroom built on a sense of community, on common bonds and friendship. In small clusters we relived the day, joked about flubs, cheered about small triumphs, patted one another on the back, and enjoyed our company. This spirit would only deepen in the weeks and months ahead. On our second day we found the school locked down. Marijuana possession they told us—and not for the first time. The Kenyon students thought this felt real in contrast to the range of learning they had experienced the previous day. It confirmed a not well-disguised set of expectations of how badly urban public education function—ill housed (in an abandoned middle school while a new “state of the art” facility was under construction), ill fed (tatertots and grilled cheese) and ill mannered. CSA, as we came to call it, was all of these, as well as none of them. In retrospect, we ought to have discussed the complex issues swirling around race even more directly. [ RS: This moment resonated so much with me, as I know it did with other students that share a similar racial and socio-economic background, because this was the first time I had witnessed recreational drug possession as having such dire consequences. The desperation in the voice of the principal begging the students to keep their distance from marijuana exposed how unevenly consequences are distributed within our society, and how much that inequality imprints itself in formative experiences of youth.] Members of our all-white class felt uncomfortable in their minority status, unsure about how to best navigate this sea of difference. And while they had read several books on critical theory that addressed teaching across boundaries of class and race, we did not actually visit this issue on the ground. In fact, they did not raise this issue till well after they had completed the course–and they did so only in private conversations with me. [ EC: I actually think I did bring this up in class several times, but looking back on it in tandem with rereading about the tricky dynamics of the class — louder male voices, many females whom I felt were quieter, sweeter, less brash, for lack of so many better words — and at a certain point in the semester, I felt exhausted about sounding (in my mind) pushy/etc./etc. in class. I remember in one class (I think it was right after we’d gone to CSA for the first time in October) and saying how I didn’t feel comfortable just going up to kids at CSA and even just to mingle or be casual/conversational because I felt so crazy uncomfortable being this white college kid sitting in the back of their classroom with no communicable good reason other than we were clearly white kids there to see an “urban education environment” (“Are you student teachers?” “No, we’re college students.” “Oh, but are you studying to become teachers?” “Not exactly.” “Then what are you doing here?”). I had said it didn’t feel like my place (at this point in the conversation, we’d extended this to wider discussions of spaces for people of color, like the Afropunk festival or “all the black kids sitting together in the cafeteria”), and you (P) and Riley had made a point like, “You just have to go in there and be a person, you’re all people, talk to them like they’re people.” I still think about this a lot and tried to keep it in mind when we went to CSA in January, but I know I’m still not sure how to (or if I should) internalize it yet.] Next year’s Sankofa Project will respond directly to this obvious neglect on my part and do so at our first class in August. 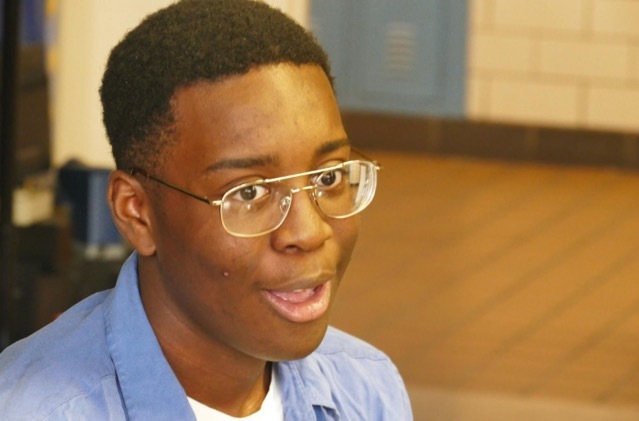 We didn’t see Jason, who was the senior-class president, for almost three months when at the depth of the January polar vortex that sent temperatures as low as -20f we reappeared at the school for our week-long residency. As in October we lived and visited with local alumni families whose generosity and loyalty proved indispensable. One host, Susan Berger, even sent her “kids” off to school with matching insulated lunch bags. After school we gathered daily in the same room where we had talked to Jason to compare notes and decide where to meet for dinner. 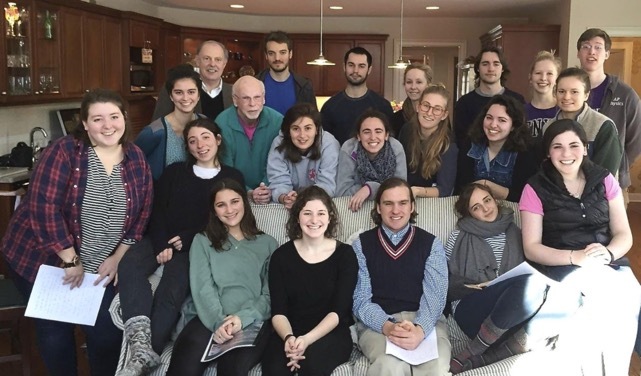 After each of the four days in school (the frigid air cancelled the fifth) the Kenyon students’ depth of understanding grew as they engaged more deeply with each classroom, with each of their teachers and with the students. Now they assisted in art projects, lead discussions in history or social studies, and worked one on one with CSA students who sought them out for assistance. Evenings they insisted in discovering a new restaurant or tavern—or both– together. They clearly enjoyed one another’s company and, like veteran teachers, they engaged in the after school ritual of talking about “their” kids and cooperating teachers: “You won’t believe what Porter said today.” “I don’t think I was ever that sassy in high school.” I’d like to think that this shared common experience grew organically out of our time together, first at Kenyon and then in Cleveland. This group of college students from a variety of majors and from three different graduating years had forged real friendships built on their collaborative, common experiences. It had become a real pleasure for me to both share this community and observe it. “You going to come party with us tonight,” drifted across the long table on our third evening. “Sure. If we are done at 10.” It was 9:45. I liked the invitation and they my self-deprecation. This heightened sense of community, the consequence of our democratization process, had gained its own momentum. There was little I had to do, except dip the oar into the water to help correct the course. At the end of our winter break week in Cleveland we returned to campus for second semester classes. In addition to our seven days in Cleveland at CSA our seminar had met for fourteen weeks during the fall. Still, much work remained. The course granted an extra half unit of credit given the demands of time and travel during two “vacation” stays in Cleveland. This became a real challenge to the students, for our syllabus required another month of intense work during which they were to complete a project (and publicly present to the Kenyon community) that would embody their experiences at CSA. They met regularly over this next month, finding common times, despite carrying a full schedule of second semester courses. They accomplished this project, a museum exhibit, almost entirely on their own. The only dip of my oar occurred at one of the first planning discussions (during this process the students invited me to attend only if they might need my advice). Up to this point they had worked in four small groups, each focusing on a different component of the exhibit: choices, authority, curriculum, and support. It had occurred to them that they wanted to include students from CSA in the process. But how, and in what capacity? Take the exhibit to Cleveland? Video students at CSA and include those interviews? It was one of those discussions that had overlapping and competing points of view and that kept going around and around, without finding a place to settle. I offered only this piece of clarification. “Whatever you do make sure you include these kids; please don’t make them simply objects.” Hardly profound, but it broke the logjam almost immediately. The Kenyon class seized on the idea of inviting a group of CSA students to campus, sharing their own college with them and then hosting these student visitors as guests at the exhibit. All I had to do was come up with the money for the bus! Twenty CSA students and three of their teachers, already associated with Kenyon through our dual-enrollment KAP program, arrived after lunch, found the college students waiting for them, and walked down the stairs of the small informal exhibit space to the gallery below. They found the lower floor of the Horn Gallery, an informal student-run exhibition and performance space created from a converted three-car garage, filled with at least a hundred other Kenyon students. Noses up against the displays on the wall, gesturing at the life sized bubble-wrap “doll” suspended in the middle of the gallery, peering into the ratty principal’s office constructed in the corner, or reading the text of the Common Core pasted along the rear wall , the audience buzzed with engagement. [ RS: Our group recorded a conversation that we had with students at CSA, punctuated with sounds that we heard around the school– without anything additions from us or our class. Throughout Sankofa, one of the strongest take-aways was that our nation makes decisions for students based on adult and bureaucratic reasoning, which turns the concept of “students” into a collective conglomeration. We wanted voices to speak as their own, and for the surrounding sounds to resonate as the environment–without anyone else’s interference in presence or sound.] 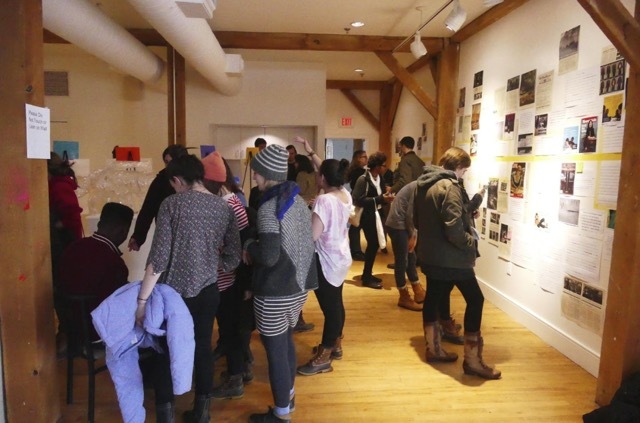 Kenyon students, CSA Students, and faculty from both schools mingled, embraced, even debated as they circulated around the exhibit space. The exhibit abstracted the inner working of an almost entirely minority urban public school as understood through the eyes of white upper-middle-class college students. It took the audience into the school as represented by the artifacts of material and visual culture—the principal’s office, Common Core directives, student writing—and simultaneously interpreted the school experience through text and images generated by the Kenyon/Sankofa students. 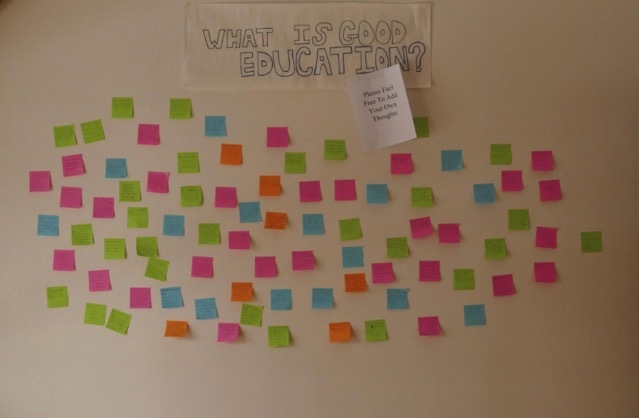 The exhibit included an interactive board that asked, “What do you wish for in education?”, a timeline of educational reform, and a video of interviews with CSA students. 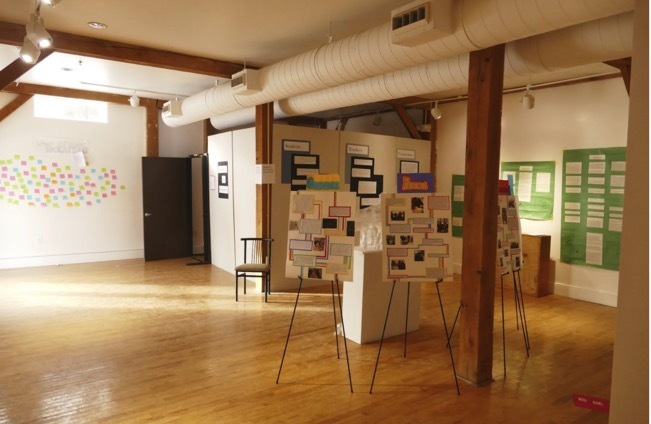 The exhibit represented the culmination of an experientially based inquiry into urban public education accomplished through the pedagogy of project-based learning. 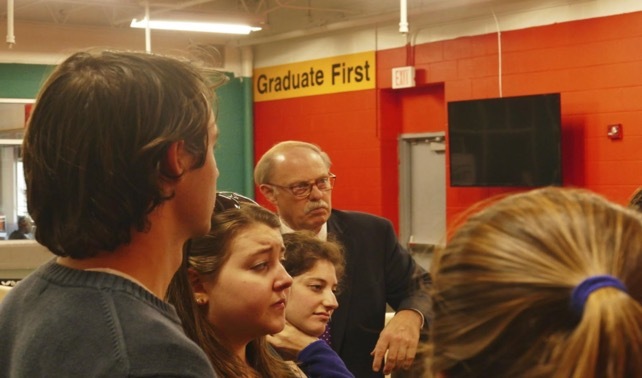 The democratic classroom provided the foundation for the learning community, at once intellectual and personal, that nurtured this complementary process of project-based and experiential learning. The improvisational and organic process had evolved from a simple set of questions posed in the last week of August (What do you hope for? How would you like this to work?) into a public, collaborative presentation that “showed” the results these nineteen Kenyon students worked so hard to accomplish. 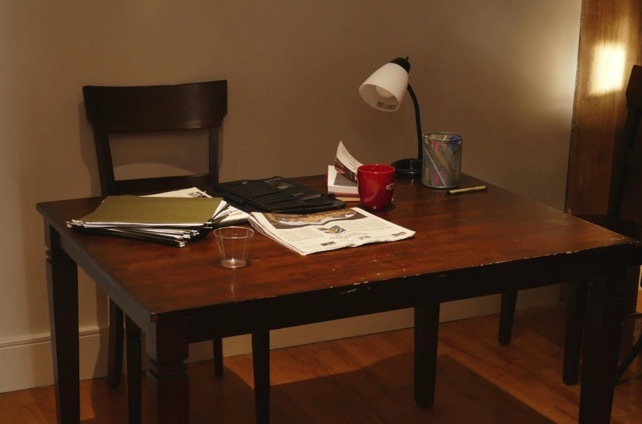 That they did so by including the objects of their study as participant-observers of it (just as they had been earlier at the Cleveland School of the Arts) made the process all the more rewarding. It was the most satisfying teaching experience I’ve been privileged to enjoy.